There are unmistakable signs everywhere. The blown roofs, the fragments of shattered home, the dry taps, the patches of darkness, the dead spots, all painful reminders of the miseries inflicted upon the island last year by Hurricane Maria. Nine-and-a-half months after the nighttime destroyer made an unwelcome detour into our lives, key services, from telecommunications to electricity to water, are still not fully restored, and the island's important money earner, the tourism sector, celebrates every small step forward. But it's the restoration of housing that's of most concern to Severin McKenzie, an experienced architect who observed the rebuilding effort after another devastating storm, Hurricane David, nearly forty years ago. Back then there was a different spirit that drove Dominicans, from the leadership to the proletariat, to rebuild, Savarin told The Sun in a previous interview. But now, he says, there are too many reasons to be unhappy, beginning with the shortage of skilled labour to the unsustainability of the houses that are coming up. "We still have a shortage of skilled labour on the island and I am not happy about that," he says, a shortcoming he has previously identified. "We are also seeing some people going back to their old building ways as they do their rebuilding and I am very disappointed about that. I have some serious concerns about the quality of the construction taking place, and sadly, we may have the same results if another hurricane hits us." He does not grade the progress in the way most people would, so there are no "A" or "C" or "F" ratings for any of the important sectors such as business, which he says "is coming back", manufacturing, or anything else. But he leaves little doubt about his level of satisfaction with manufacturing. "The manufacturing sector is yet to fully recover and we are yet to ensure that we do what it takes to get it back on track. We just cannot be satisfied with where we are and could have been much better." 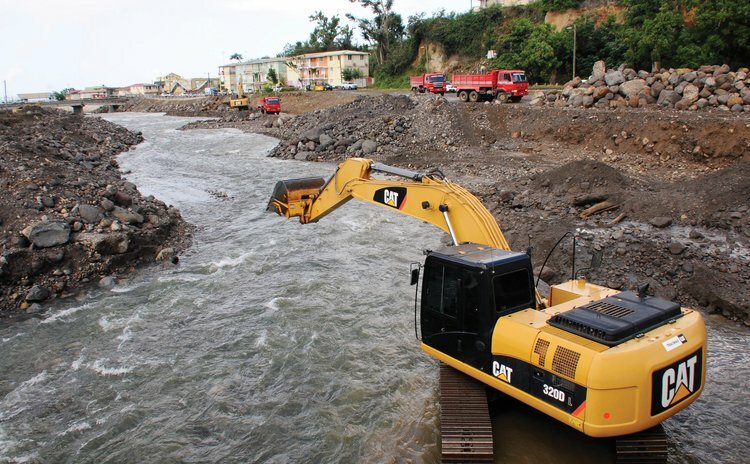 The road to full restoration of water has not been an easy one either, with the sole water provider, the Dominica Water & Sewage company Ltd (DOWASCO) yet to have the precious commodity in every home. True, water has been restored to 96 per cent of consumers, according to general manager Bernard Etinoffe, but numbers can sometimes be misleading. Even for those who are back on "the system is very vulnerable", Etinoffe says. And there are villages in the west and the south where the water company continues to grapple, with "doing our best" the best DOWASCO can offer at present, even as it offers some hope. "We still have some challenges in area like Morne Rachette and what we are doing now is building a pumping station in the Macouchrie area which is nearing completion. It will be completed within a month," the general manager tells The Sun. "In the Tete Morne/Pichelin area we are also doing our best." When the hurricane swept through Dominica with its 160 miles per hour gusts in the middle of the night on 18 September, in addition to leaving virtually every building damaged or reduced to rubble, and lives in ruin, the mighty Maria also hit telecommunications with a vengeance. In the near ten months since, both providers, Digicel and Flow, say they have done well and are close to full capacity again. There's little more from Digicel, and there were few specifics as Ferdina Frampton, the Flow Dominica spokesperson, updated the country. But she said enough to suggest the company which calls itself "a telecoms tour de force" is moving past the days of patchy, unreliable mobile service in small parts of the island. "We are working hard to have things fully back to normal, so far we have been able to ensure that most of our cell sites are operational," Frampton said on the Flow programme on the state owned DBS Radio. "We are happy at the progress made thus far…"
In the few short hours of darkness that the nightmare of September, 2017 pounded the island, it turned the greenery of the Nature Island into nothing more than the likeness of the aftermath of a massive forest fire. It also took a toll on the all-important tourism industry, which ground to a standstill. Hotels, sites and attractions, air access, all suffered gravely. But things are coming back, albeit slowly in some cases, but enough for the marketers of the island, the Discover Dominica Authority (DDA) to celebrate each achievement. Of the 962 rooms available prior to the storm, 393 rooms, or 41 per cent, are now available, 19 of the 23 official sites and attractions are opened and the authorities were able to salvage 29 cruise ship calls for the 2017/18 cruise season and saved the entire 2018/19 season, with 268 calls scheduled, Colin Piper, the chief executive officer of Discover Dominica, told regional and international journalists at a press briefing on 30 May. Secret Bay hotel is scheduled to reopen in November this year, and the famous Fort Young Hotel is scheduled to reopen in February next year with 101 rooms, Piper said at the time. The 2017/2018 cruise season – October to May - was a tough one for us," the tourism executive said. Overall, visitor arrivals took a significant hit and the effects continue to be felt even now, although the worst seems to be over. "For the first six months after Maria . . . on average we were down 40-50 per cent from a visitor arrivals perspective. March has been more promising [so] we are down 19 per cent," he said. But there's much optimism for summer travel when Dominicans return home to visit family and friends, and when visitors from the French department begin to come back. Therefore, Piper says, "when we move to the latter part of this year we will look to get many more visitors to the island".